How does arrow length affect a shot? Shorter arrows are lighter and can generally be made to be stiffer than long arrows. A light arrow will fly further and faster than a heavier arrow. 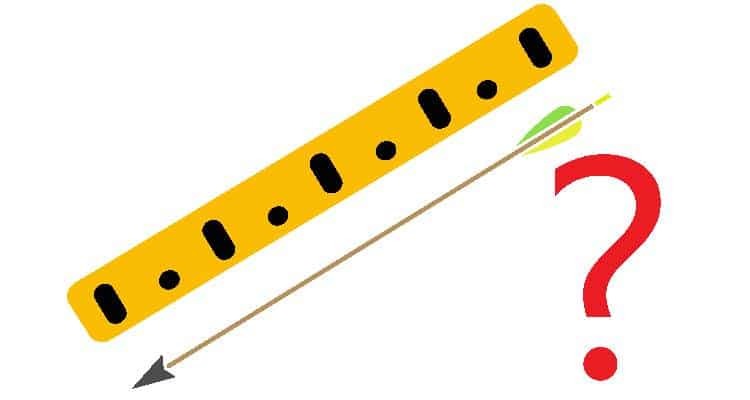 An arrow flexes as it flies through the air and a shorter and stiffer arrow will flex less and this also helps with additional speed and flight distance. Arrows are generally sold and measured in inches in sizes anywhere from 20” to 32” so before ordering some you’ll need to know your correct arrow length. So you know that the shorter and stiffer the arrow the better for speed and accuracy, the tradeoff against this is safety. If your arrow is too short you could be in danger of shooting yourself through the hand as when you draw it back, if you draw back too far the arrow may fall off the arrow rest onto your hand at the point of release….and then shoot you through the hand… Ouch!! (to say the least). This happens, it might sound far fetched at first, but if you’ve the stomach for it just google ‘arrow through hand’. An injury like that may be the end of not just your archery career but could affect many aspects of your daily life, so don’t risk it, especially if you’re just beginning in the sport, make sure you get the correct length arrows. At full draw the arrow needs to extend past (if only slightly) the end of the riser on your bow so there is no chance of this happening. If you know your draw length, you can simply add either 1 or 2 inches to this to approximate your arrow length. Stand up, and stretch your arms out in front of you with your palms together and your fingertips fully extended, you need to ask someone to measure from the centre of your chest to the tips of your fingers and then add 1 inch to this measurement. If you don’t have anyone available to measure for you, you can try holding a broom handle out between your outstretched palms and making sure the end of the broom is against your chest, when you lower the broom make a note of where you managed to reach upto and measure this distance. This will give you your arrow length. The other way to measure arrow length requires a friend to assist and also requires you to have a bow available that you can hold with correct form, hold up and fully draw your bow then get someone to measure from the string or nock point all the way to the front of the riser on your bow and add half an inch. That distance will be your arrow length. If you’re a member of a club or have a coach, or are just fortunate enough to have lots of kit around you can make something called a ‘draw arrow’. This is just an arrow which is longer than your usual arrow and which is marked with measurements all along the side. You can hold your bow, draw this arrow and take note of the measurement shown just past the end of the riser, this will be your arrow length. Those are the 3 ways I’ve come across for doing this, if you happen to know any more, please let me know in the comments! Very helpful! I’m a true newbie, drawn by the relaxing nature of the sport. But I’m a stickler for doing things correctly. Thanks for these terrific tips. A bullseye! Simple, straight forward, exactly what I needed to know.